At one of my regular haunts the other day, I happened upon this exceptionally fine copy of what may be considered the great country singer Riley Puckett’s best record. As it happens, some of Puckett’s relatives in Georgia are close family friends of mine, so I thought it might be nice to whip up a quick post for this fine disc. George Riley Puckett was born in 1894 in Dallas, Georgia. He was struck blind after a doctor threw salt in his eyes attempting to treat an infection. Around the time of his early performances, he was dubbed “The Bald Mountain Caruso.” Rising to become one of the most popular country musicians of the era, Puckett recorded both solo and with a number string bands, most notably Gid Tanner’s Skillet Lickers, from 1924 until 1941. He died of blood poisoning in 1946. On Bluebird B-5587, Riley Puckett plays guitar and sings two of his finest songs, accompanied by the Skillet Lickers’ Ted Hawkins on mandolin. Both sides were recorded March 29, 1934 at the Texas Hotel in San Antonio, Texas. On side “A”, Riley soulfully sings and yodels Carson Robison’s humorous tale of salvation on the wonderful “I’m Gettin’ Ready to Go”. 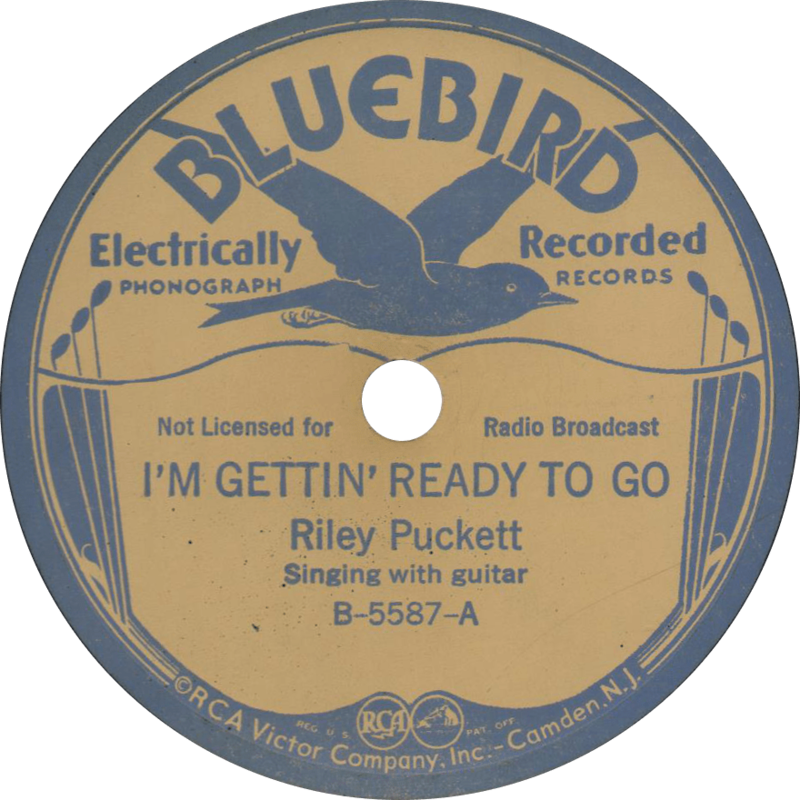 I’m Gettin’ Ready to Go, recorded March 29, 1934 by Riley Puckett. On the “B” side, Puckett delivers a marvelous performance of one of his most famous songs, “Ragged but Right”. This entry was posted in Records and tagged 1930s, 1934, Bluebird, Carson Robison, Field Recording, Folk, Hillbilly, Riley Puckett, San Antonio, Singing with Guitar, Ted Hawkins, Texas, Yodel by R. Connor Montgomery. Bookmark the permalink.